North Denes Market Mill post mill No. 4A stood between Wellesley Road and Nelson Road from which it was accessed. The mill buck was set on a roundhouse. In 1803 the mill was using 2 pairs of French burr stones, a flour mill and jumper but by 1854 only one pair of stones were in use. In its latter years the mill was powered by double shuttered patent sails. A WIND-MILL standing on the Danes of Yarmouth, called the Market Mill, well found with all Materials and in good Repair. Enquire of the said Mrs. Ann Dobson, Widow or of Mr. Ramey of Yarmouth. 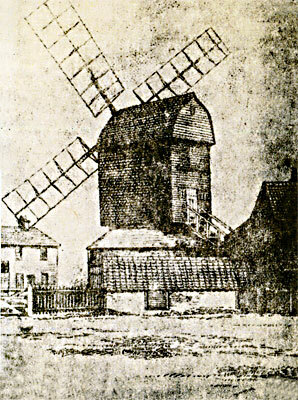 THE WIND-MILL standing on the DENE of YARMOUTH known by the Name of the Market Mill, late in the occupation of Robert Sawyer. N.B. The Estate for Life of Mrs. Anne Dobson, Widow, in the same Mill may be Sold. Enquire of the said Mrs. Dobson or of John Ramey, Esq. of Yarmouth. On Wednesday 24th November Inst. 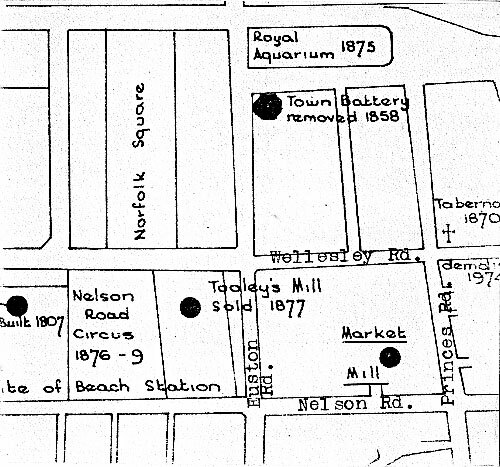 at 3 o'c in the Afternoon at Mr. John Eldridge's, the Sign of the White Horse in Great Yarmouth THE WINDMILL called the Market Mill with the Appurtenances, standing on Yarmouth Denes, the best situation of any Mill in the Town, now in the occupation of Richard Allen. Enquire of Mr. Peter Kirkman or Mr. Thomas Clowes, Attorney. ... The site was probably built over shortly after 1850. To be Sold by Auction By Mr. Seaman On Wednesday 16 February 1803 at 4 o'c at the Cranes Tavern on the Quay, Great Yarmouth. The Capital Freehold WINDMILL, Stable, Granary and Outhouses situate near the centre of Yarmouth Denes and lately occupied by Mr. John Barber. The MILL contains two pair of excellent French stones and every requisite appurtenance for carrying on the trade of a Miller in its most extensive branches. The purchaser may have immediate possession. Apply to Mr. Worship, Attorney at Law, Great Yarmouth. Notice is hereby given to all persons who are indebted to the Estate of the said Bankrupts to pay the amount of their respective Debts with onr month from the date hereof to Mr. Thomas HAMMOND the younger of Great Yarmouth, Miller, on of the Asigneees, otherwise legal means will be taken to enforce the payment thereof. Rate at 1s. 4d. in the Pound £1. 12s. The following Desirable Freehold MILL and other Properties in Great Yarmouth. A well situated FREEHOLD POST WINDMILL known as the "Market Mill" together with a Dwelling house, Warehouse, Cart lodge, and Stable situate on the Denes and now in the occupation of Mr. Pilch, whose tenancy will expire at Michaelmas next. Apply to Messrs. F. & W. Worship, Solrs. Great Yarmouth or the Auctioneer. Rate at 1s. 2d. in the Pound £1. 1s. To be sold by Auction by PETTINGILL at Dukes Head Inn, Great Yarmouth, Wednesday 5 April 1854 at 3 o'c. The post windmill and roundhouse with one pair of stones, flour mill and jumper as now standing on the Denes opposite the Marked Gates and known as Market Mill, to be removed from the present site at the purchaser's expense. Apply to the Auctioneer, Great Yarmouth. ... Post Mill formerly standing north of Princes Road, east of Nelson Road North. Harry Apling suspected the the mill buck was taken to Cobholm in 1854.